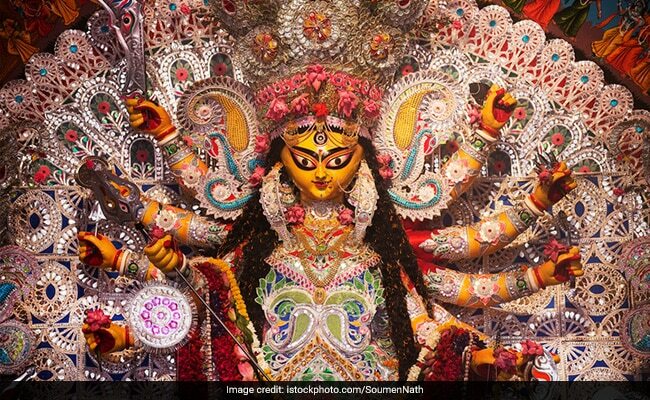 New Delhi: Delhi's oldest Durga Puja turns 108 this year. Among more than 350 pandals that the national capital witnesses during puja season, the Kashmere Gate Durga Puja stands out for its focus on tradition. Modern themes have no takers here. "Themes can never reflect the charm or the beauty of the traditional," said one of the organisers at the Delhi Durga Puja Samiti, the oldest puja committee in the city. The first puja was celebrated in 1910 at Roshanpura Kali Mandir near Nai Sarak. From 1913 to 1946, the puja was organised at a dharamshala (community hall) near Fatehpuri Mosque. Later, it was shifted to the Bengali Senior Secondary School at Alipur Road near Civil Lines. Earlier, the idol used to be brought from Benaras, but 1926 onwards, the idol was made in the city itself. From maintaining the quintessential "sabeki ek-chala-thakur" (traditional one platform) goddess Durga to carrying the idol in a bullock cart for "visarjan" (immersion), the organisers have stuck to the traditional ways. "The bullock cart visarjan is organised only by us. No other pandals hold such a procession in the national capital," Samarendra Bose, committee member, told news agency IANS. During puja time, the pandal turns into mini Bengal. The priest and the dhakis (drummers) are called from Kolkata. Cultural dance and music performances here are a must-attend for decked up pandal hoppers. "Unlike other pandals, we don't invite any artistes. Local residents perform in these cultural programmes. Also, we make sure that all the functions are conducted in Bengali," Mr Bose said. The bhog is another highlight of the celebrations here. "Every year, around five to six thousand people partake the afternoon meal. And on Ashtami (the eighth day), the turnout crosses more than 10,000," he added.